-40°C to +85°C (-40°F to +185°F). For the N4200 module, the temperature range is 0°C to 60°C operating temperature. 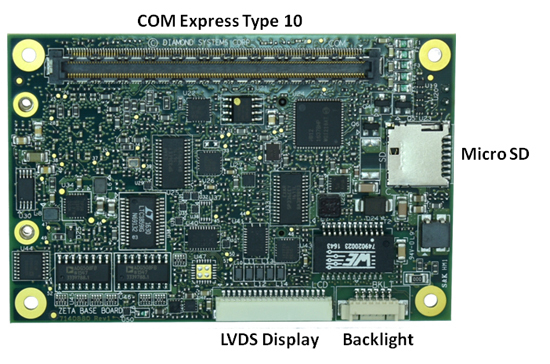 The Zeta COM Express SBC family of ultra-small embedded computer boards combines a COM Express Mini CPU module with a same-size carrier board to create a complete embedded PC. 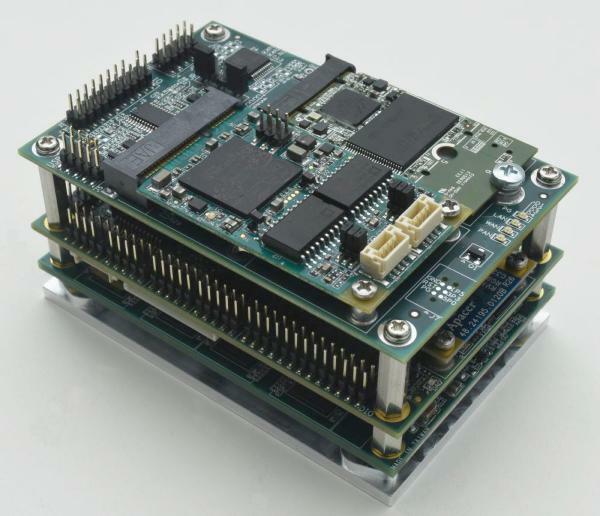 Designed in the COM Express Mini Type 10 form factor (84 x 55mm/ 3.3 x 2.2 in), Zeta provides an ultra-compact, industry-standard form factor solution. This layered architecture offers the highest functional density for any given footprint. 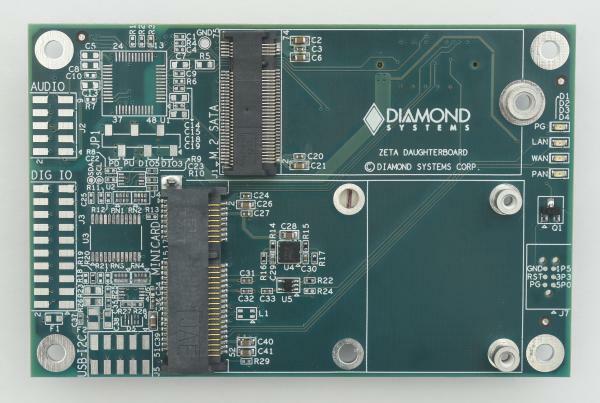 As a comparison, Zeta offers functionality and performance equivalent to Diamond's top-selling Aries SBC at just 40% of the size. Zeta's small size and high feature density make it an ideal choice for mobile applications. It stands ready to meet the challenges of these environments with a wide range 6-36VDC input voltage, a -40 to +85°C operating temperature range, and fanless heat spreader cooling (heat sink options are available). Long product life: The majority of today's x86 embedded processors offer limited lifecycles of 5-7 years, so any long-life product dependent on an x86 single-board computer (SBC) is likely to require redesign sometime during its lifecycle. Using industry-standard COMs lets you easily migrate to a new generation CPU module in the exact same form factor and containing the same feature set, with virtually no hardware or physical redesign efforts. Zeta is ideal for long-life applications such as Military, Medical, and Transportation. The bottom side heat spreader on Zeta provides the most efficient cooling solution in a size-optimized design, enabling Zeta to run reliably at up to 85ºC. The heat spreader conducts heat directly to the system chassis for maximum heat dissipation to the ambient environment and minimum radiation into the enclosure interior. By reducing the interior temperature, Zeta helps to improve overall system reliability. In addition the bottom side heat spreader leaves the entire top side of the board free for expansion and simplifies system configuration and maintenance. Zeta is available with four different processor options. 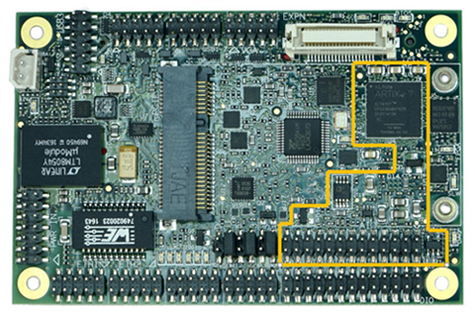 Each CPU may be paired with both the digital I/O and full analog/digital I/O baseboard. Operating system support is available for Linux (Ubuntu 16.04 LTS), Windows Embedded 7, and Windows 10 IoT Enterprise LTSB. Drivers and instructions are available for free download on the Diamond website. Software development kits / board support packages are available as well and consist of the selected operating system installed and pre-configured on a solid state flashdisk (SSD). Zeta is available in a complete development kit that includes a full set of I/O cables and the selected SDK. Simply install the pre-configured flashdisk, attach cables / keyboard / mouse / monitor, power up, and the system is ready to run. he Zeta cable kit includes cables for all I/O features on Zeta except LCD. Details are provided below. Individual cables are available as a special order item; minimum order quantities and leadtimes may apply. 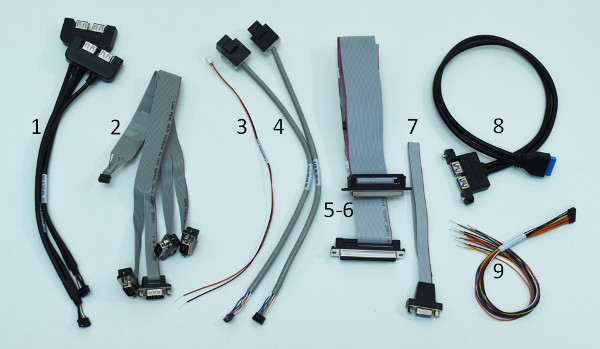 An LCD / backlight cable kit is available for specific displays used in our manufacturing environment. Customers may purchase this cable kit as a starting point and modify the LCD ends to support their specific display. 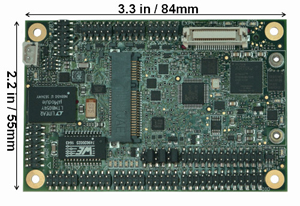 Zeta (top) "A" Model baseboard layout and baseboard bottom (below). 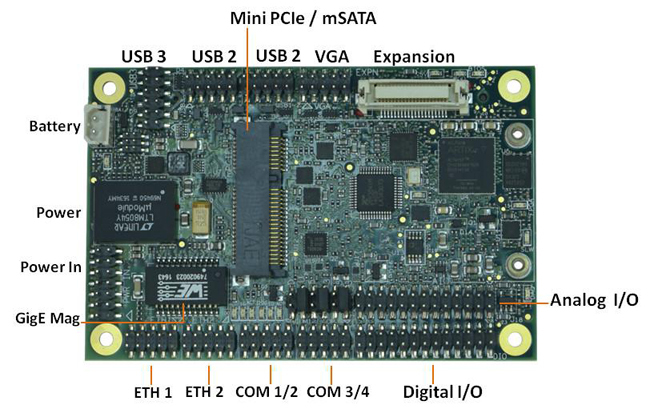 A PCIe minicard socket and an expansion connector (see below) provide the ability for further I/O expansion using industry standard I/O modules. Zeta is available with two different data acquisition circuits, denoted by either A or D in the model number. Both circuits are available with any processor option. 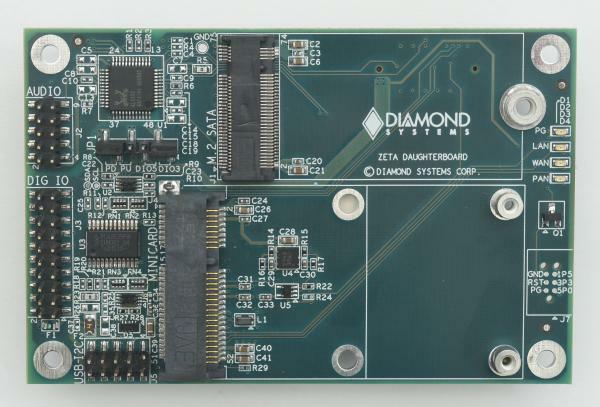 All digital and analog I/O features are supported by Diamond’s industry-leading Universal Driver software, which provides a C language programming library that supports all features in an easy-to-use, high-level fashion. Demo programs with source code and executables are included to demonstrate the use of each library function. A graphical monitor and control program provides easy access to all the I/O features and lets you prototype your application quickly as well as debug problems. Universal Driver is available as a free download from our website upon acceptance of our software license agreement. 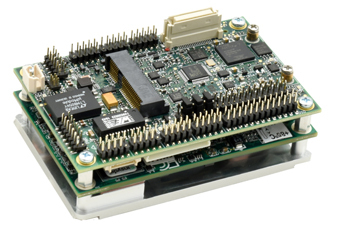 Zeta "A" models include a complete data acquisition circuit with a combination of analog and digital I/O features. 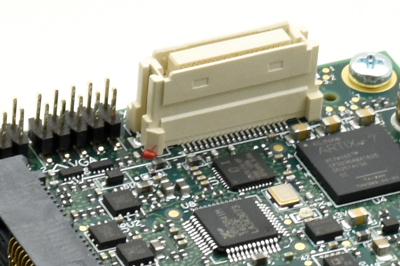 The circuit controller is an FPGA that interfaces to the host CPU via the LPC bus. Systems which do not require any additional I/O beyond the baseboard features may use the baseboard’s MiniCard/mSATA socket to contain the system bootable mass storage. For Linux operation, the Micro SD socket may also be used for bootable mass storage, leaving the MiniCard socket available for expansion. A system running Windows which requires additional I/O must use the optional daughterboard. In this case the designer has the choice of either the baseboard mSATA socket or the daughterboard’s M.2 socket for the bootable mass storage. If the M.2 socket is used, then both the baseboard and the daughterboard minicard sockets are available for I/O module installation.